A.P.O.C. Swords are made by Dragon King and designed by Gus Trim (Atrim). These functional swords feature removable black G10 handle scales and thick full tang 9260 spring steel blades. 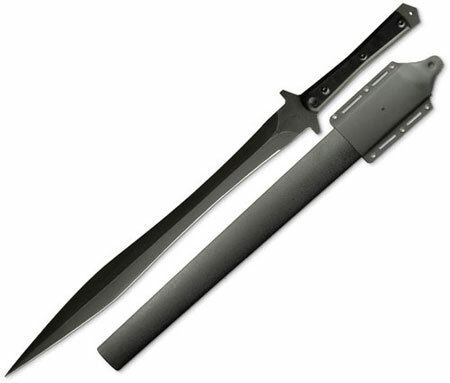 The black, textured fiberglass scabbards are MOLLE compatible. 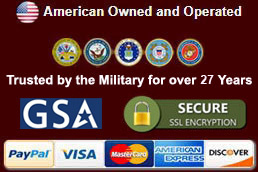 Buy the popular A.P.O.C. 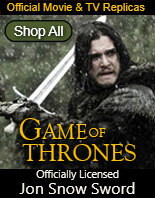 Swords on sale now. A.P.O.C. 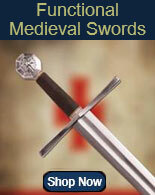 Cutlass Swords are 29 ¾ inches in all and weigh 1 pound, 15 ounces. 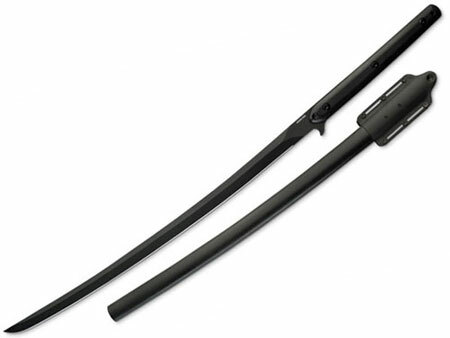 These functional swords have a 21 ½ inch black oxide coated 9260 spring steel blade that has a tapered back edge on the tip. The double hooked guard prevents hands from sliding onto the blade edge during use. The full tang blade is wrapped by the 8 1/8th inch G10 handle which is triple riveted to the blade. The handle slabs, rivets and blade profile are smoothly flush all around for comfort and to ward off blisters. The black, textured lightweight fiberglass scabbards have a MOLLE compatible Kydex platform that allows the sword to be attached to a belt or pack in multiple carry positions. A notch in the handle and the platform permits the scabbard to be both unsheathed and securely locked. Buy the APOC Cutlass Swords for $149.99. A.P.O.C. Katana Swords are 36 5/8th inches in all and weigh 2 pounds, 6 ounces. 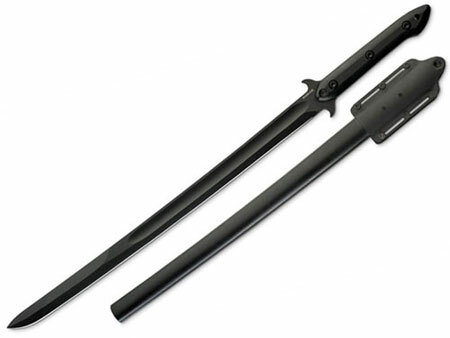 These functional swords have a 23 ½ inch black oxide coated 9260 spring steel blade. The full tang blade is wrapped by the 11 3/8th inch G10 handle which is triple riveted to the blade. This katana, which was called the Little Tigress when Gus Trim was designing it, has a hooked guard to prevent the fingers from sliding onto the blade edge during use. The handle slabs, rivets and blade profile are smoothly flush all around for comfort and to ward off blisters. The black, textured lightweight fiberglass scabbards have a MOLLE compatible Kydex platform that allows the sword to be attached to a belt or pack in multiple carry positions. A notch in the handle and the platform permits the scabbard to be both unsheathed and securely locked. 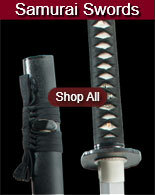 Buy the APOC Katana Swords for $159.99. 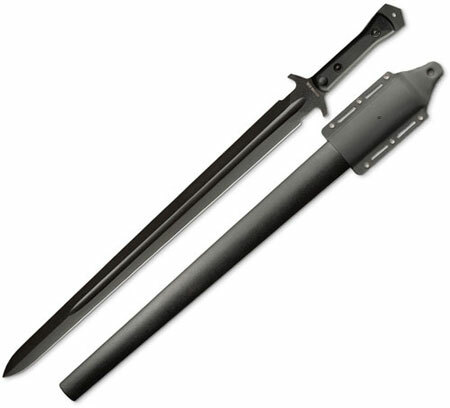 APOC Wasteland Gladius Swords have a Roman design in a contemporary package designed by Gus Trim. The Wasteland Gladius is modeled after larger gladius designs that historically featured a pronounced “wasp-waist” or “leaf blade” curvature. The 21 3/8th black oxide coated 9260 spring steel blade flares out from 1 3/8th of an inch to 2 inches making the sword a chopping cutter with a piercing point. These full tang swords are 33 inches in all and are triple riveted to the 9 inch G10 handle. They can be used as either a single-hand or two-hand sword. The black textured fiberglass sheaths are fitted to a Molle compatible Kydex platform that allows a secure carry on a belt or a pack in multiple carrying positions. For belt or sling carry setups the platform has four slots that measure 1 3/8 inches by an eighth of an inch. A notch in the handle and platform allows for stealth-like unsheathing as well as securely locking the sword. They weigh 2 ½ pounds. Buy the APOC Wasteland Gladius Swords for $169.99. A.P.O.C. Broad Swords are 29 ½ inches in all and weigh 2 pounds. These functional swords have a 21 ½ inch black oxide coated 9260 spring steel blade that features a double cutaway in the blade profile. Designed by Gus Trim, these full tang single-handed broadswords are triple riveted to the 6 ¼ inch G10 handle. The black textured fiberglass sheaths are fitted to a Molle compatible Kydex platform which can be used to secure the swords to a belt or pack in multiple carrying positions. For belt or sling carry setups, the platform features four slots that measure 1 3/8th inch by 1/8th wide. A notch in the handle and the platform allows for stealth unsheathing and secure locking. These swords have a point of balance at 5 inches. The thickness at the guard is 5.9 mm. 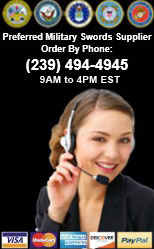 Buy the APOC Broad Swords for $169.99.